Star Trek TOS - 1x07 - What Are Little Girls Made Of? - Pretty lame episode with no significant long term continuity. Dr. Soong on Star Trek TNG will later (re)invent androids, but it is presumed that his work occurs in isolation with no connection whatsoever to Dr. Korby's discoveries. - How could Kirk have strangled an android Korby? 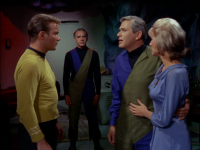 - This episode establishes that Kirk has a brother named George Samuel Kirk. He has a wife and three sons. Kirk calls him Sam. - Kirk killing an android. - Kirk being "cloned" into an android. - Kirk debating with his android counterpart. - Android Kirk calling Spock a half-breed. While it's annoyingly unoriginal to frame another episode around a Kirk double and another guest star with a hidden agenda, I quite liked Kirk's method of making Spock aware of the impostor by filling his thoughts with hate for Spock during the creation of the Kirk android. 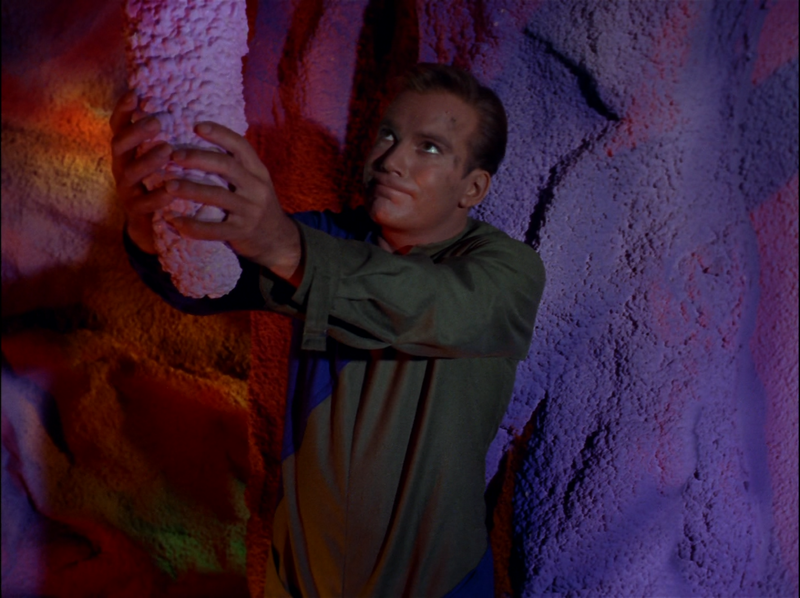 Kirk couldn't have known for sure that his tactics would work, so the entire attempt was just one big lucky guess. Nevertheless, that sort of boldness is exactly what makes a good captain. However, the real meat of the episode lies with Dr. Korby's discovery of technology from an extinct alien civilization capable of manufacturing androids. This technology is even capable of transferring the human consciousness into an android, a capability that he uses to save his life, after which he apparently makes no attempt to contact Earth because he's afraid that his people would find his discovery somehow distasteful. This seems like an irrational notion up until the point when the Enterprise arrives and Kirk and Chapel seem to validate Dr. Korby's irrational fears by reacting with horror at the very idea that Korby has created androids. Kirk even compares him to Hitler at one point without much of a reason. At about 32 minutes into the episode Korby proposes seeding androids incognito to Earth and its colonies in secret as a means to avoid what he believes would be mass hysteria if their existence were to be widely known. But rather than relieve Korby of his paranoia by explaining to him that that would be unnecessary and that Earth would welcome him, his discoveries, and his android counterparts into the fold, Kirk spends the entire episode overreacting to Korby's overreaction. The ensuing conflict results in the deaths of everyone on the colony and then Kirk goes about his merry way as if nothing of consequence has occurred. In so doing, the implications of the existence of this android technology are wasted and forgotten. 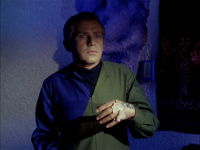 Kirk makes no attempt to retrieve or preserve the technology and the episode itself seems to condemn the very existence of such a technology. At several points, the episode goes out of its way to make the argument that an android which thinks it's superior to a human is a threat which must be destroyed. 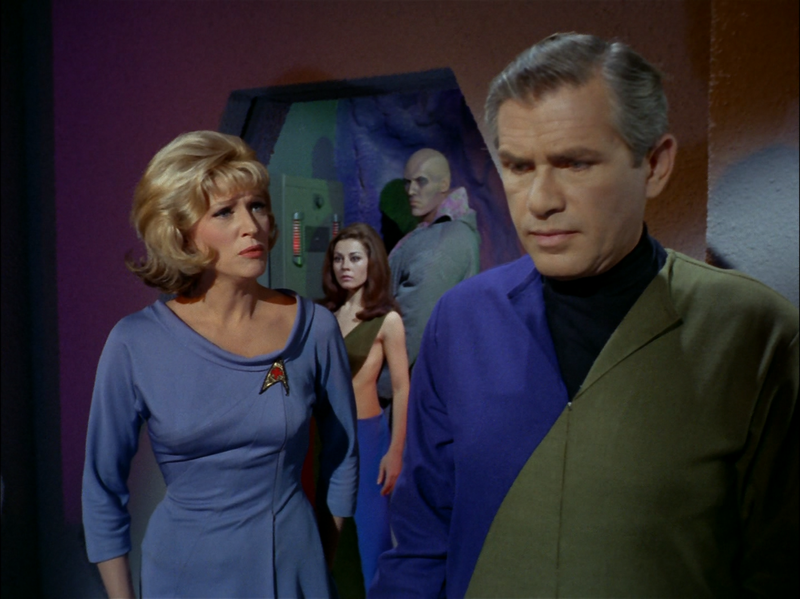 The episode also demonstrates that the androids were emotionally unstable and not very good critical thinkers, seeing as how Kirk was so easily able to exploit conflicts between their emotional states and their programming. While it's clear the technology has flaws, none of this is enough to support the episode's apparent condemnation of the very idea of androids. Instead what I can only assume the episode intended us to believe is that Korby was lying to Kirk and that his real intent was to replace key personnel on Earth and its colonies in order to take them over. This is certainly a possibility, given the Kirk double and Korby's admitted desire to keep his discoveries a secret, but at no point in the episode does this premise become conclusive. At best, Kirk could only have a reasonable suspicion of Korby intending to do such a thing and it was as irresponsible for Kirk to act on such a suspicion without proof as it was for him to make no effort to preserve or retrieve any of the technology found on that planet for further study. Overall a pretty lackluster episode. Kind of a ho-hum episode. As you said, the best part of it was Kirk getting a message through to Spock through his double. Also, there seems to be some inconsistency as to what kind of "emotions" these droids are capable of. Also, androids wouldn't "forget" anything, only to have their memories jarred later on-- they would remember everything in perfect detail, unless they were actually programmed to forget, which they wouldn't be. Kinda weird. One nitpick too-- Andrea isn't technically an android. She's a gynoid. A rather comely one, at that! Another episode which doesn't come together in execution. In retrospect, I think there could have been something interesting to this story - the idea of Korby saving his life by transferring his brain to an android, then realizing that he is no longer the same person after doing so. But much of the episode consists of Korby boasting about how great his plans are, and it didn't convey a lot of meaning. Nor was I interested in Nurse Chapel, or all that weird TOS stuff about robot logic. Still, it isn't all bad. I like the parts of the plot relating to the android Kirk. 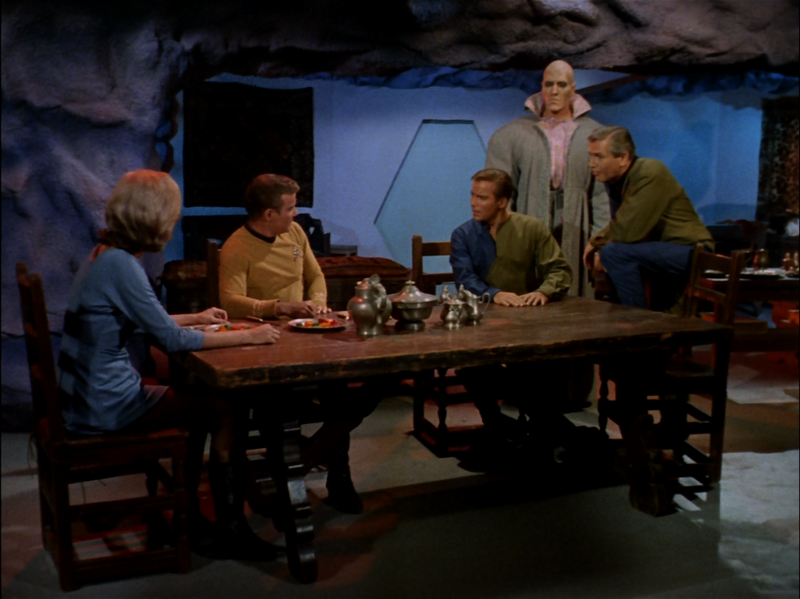 His revelation at the dining table is pretty creepy, and the real Kirk's use of "post-hypnotic suggestion" is clever. - I don't agree with the comments in the review. Korby lures down the Captain, murders two people, holds the captain hostage, and has Ruk impersonate him to cover up his crime. He then claims Kirk should bear with him, he has a good reason for it. To paraphrase, his reason is that people are too stupid to know what is good for them, so he needs to secretly take over the Federation so he can kill everyone and transfer their minds into a superior race of androids. Korby may sound mild-mannered, but actions speak louder than words, he has totally flipped out into Megalomaniacal Super-Villain territory. Kirk's sole responsibility is to stop Korby and save the Federation. That is my main complaint with the episode, that all the philosophical arguments are basically irrelevant because Korby has become such a monster. My biggest problem with “What are little girls made of?” is that it never does seem to make a whole lot of sense. Nothing seems to add up during the entire episode. Now the idea of Machine vs. Man has been played out in many a Star Trek episode. It is always the emotionless machines who lose out to the warm blooded humans who demonstrate that they are more compassionate and understanding. Yea right, and if you believe that I have some swamp land I want to sell you. But to me the main problem with this episode is the story doesn’t ever really make sense. If Dr. Korby was indeed an android then how can he express emotions like he does? All the other androids act like they are emotionless programmed robots. But not Korby. That doesn’t make sense. 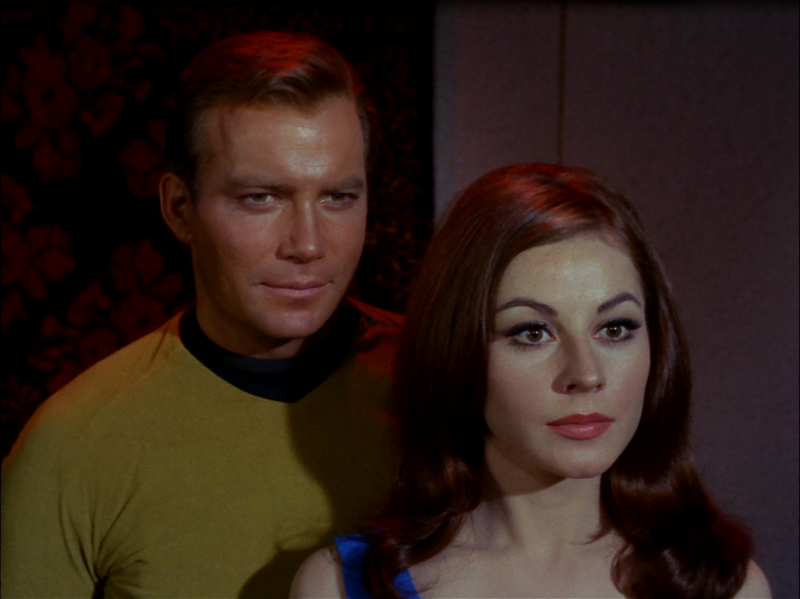 If Andrea is an android, or a gynoid, then why does she kill the android Kirk just because he wouldn’t kiss her? That doesn’t make sense. 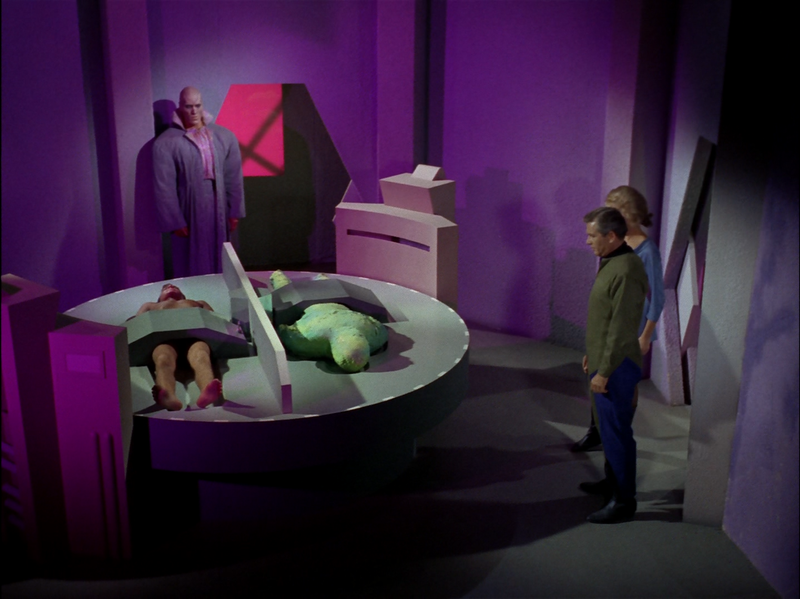 This episode was shown just three weeks after the “Naked Time” when Christine expressed her undying love for Spock. The timing of this episode always seemed a little bit strange to me. 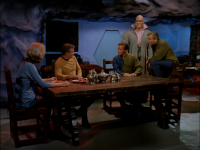 This episode is by far and away the weakest one of the entire first year of TOS. I have tried to watch it a dozen times and I always get disappointed with it. 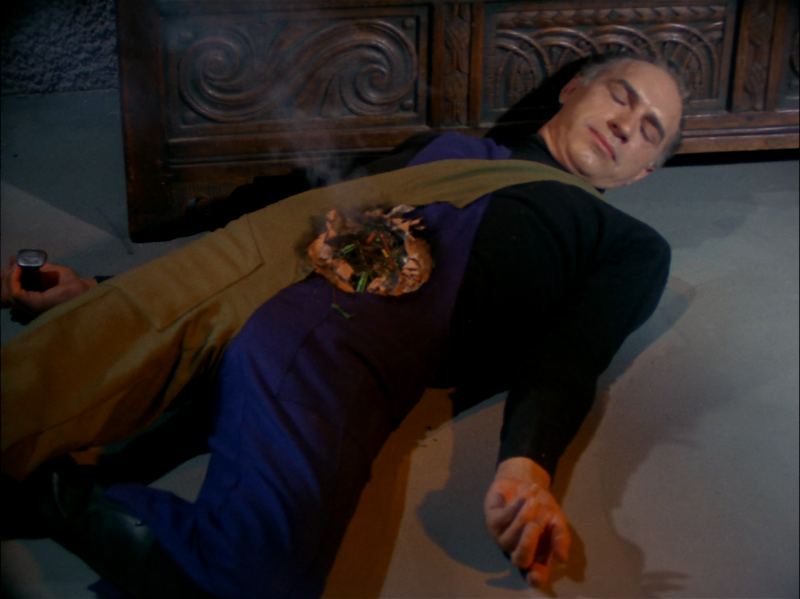 I agree with CAlexander that Dr. Korby acts insane from day one and Captain Kirk doesn’t overreact at all. I think the comparisons to Hitler are good ones. Hitler wanted to create the master race, and Dr. Korby does too in a strange way. But even discussing the story seems weird because the story never seems to fit right. I agree that the cutest thing about this episode was the android Kirk yelling at Spock. But even that didn’t make sense. Being an android with a computer for a brain, why didn’t the android Kirk realize what he has just said to Mr. Spock? In the first place Spock didn’t look upset and even if he did ( which is debatable because after all he is a Vulcan! ) ………even if Spock was upset, would an android ask him if he was all right? I don’t think so! That really didn’t make sense! All in all a very forgettable episode! Well not totally forgettable! I did write this review! Maybe a nightmare of an episode would be a better choice of words. I agree with the review and comments, not a great episode. But to me the most impacting parts of this episode were Andrea's outfit, followed by a naked Kirk spinning on a merry go round. Made the the whole episode worth it. "What Are Little Girls Made Of"
At 16:35, Kirk says, "That's why all this make no sense." Drop the "that's why" and it pretty much sums up this episode. Well, it starts out okay, but it makes less and less sense as it goes on. At the end, "making sense" gets entirely thrown out the window. The "most impacting part" of this episode is not Andrea's outfit; it's Andrea *in* Andrea's outfit! 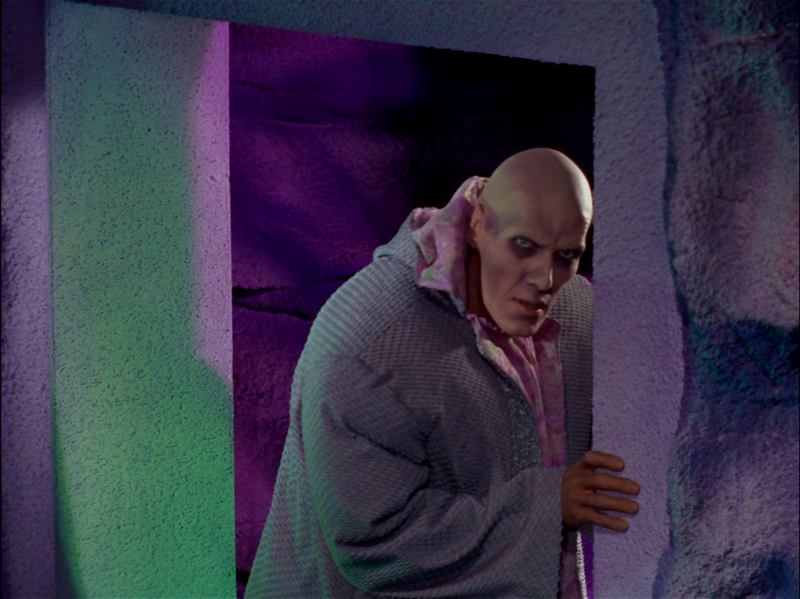 Speaking of outfits, Rock's is, uh, a bedspread? A space blanket? Rock is fun to watch. When he shows great strength throwing the Captain about, it's intense! The hand-held shot of Kirk walking down the corridor and into the turbo lift is also used in "The Man Trap". It's the same shot! The Man Trap: 21:28, Little Girls: 37:34. Mike Meares asks: "If Dr. Korby was indeed an android then how can he express emotions like he does?" The difference, I believe, is that Korby contains a "transplanted" consciousness, mind, soul, or whatever -- while the others do not. On the other hand, Rock showed anger toward "The Old Ones" and Korby, and exultation when he realized "existence -- survival must cancel out programming." Are these not emotions? Kirk strangling Dr. Korby? Yes, that's nonsensical. I guess we're not expected to remember that far back* in the episode once we learn he is an android. I suppose some do and some don't on a first-time viewing. And what caused the "skin" on the back of his hand to be sheared off? The wall, the door? Not very durable, after all! The scene in which Korby kills Rock has Rock close to him, then far from him! The sequence of shots is not self-consistent. And why does he walk so slowly toward him? I guess he's struggling to override his programming to protect Korby. But the sequence is still inconsistent. The mind is what the brain does, so you can't transplant a mind, or one's consciousness, or whatever you want to call it. Copying, I can see. And here we have a mind (not brain) being "transferred" and "re-programmed", to boot! Talk about mind-altering! To comment on everything in this episode that doesn't make sense would fill a small book. Nevertheless, Rock and Andrea are fun to watch. I'm going to have to go back and watch the episode, but I never had a problem with it. Part of it is, you have to think about the attitudes at the time. Robots and androids were generally considered scary monsters. In movies they were almost always either evil or messengers of doom. In novels and short stories, it's the same thing. It's the reason Asimov came up with his three laws, so mechanical men wouldn't realize they were smarter/faster/stronger and take over the world. When eveyone assumes something, you don't generally feel a need to spell it out. And when you discover a technology no one will trust, you hide or bury it. djb writes: " Also, androids wouldn't "forget" anything, only to have their memories jarred later on-- they would remember everything in perfect detail, unless they were actually programmed to forget, which they wouldn't be. Kinda weird." You're assuming perfect programming and perfect hardware, neither of which exist (well, above a certain complexity level, anyway, which we have surely reached in this case!). The old memories are probably archived and are therefore not easily accessible. Also, cosmic rays can flip bits. Not very often, but Rock has been around a very long time. Furthermore, androids are supposed to resemble humans. In this case at least some of them are able to "import" another's very consciousness (which is kind of ridiculous), so must resemble humans in some sense. Perhaps Rock was of that type. OTOH, these androids are far more advanced that anything we have today. But they're still designed to be like humans. Anyway, the whole story is ridiculous. Another example: "Don't you see, Roger. Everything you've done proves it _isn't_ you." Ah, so A doesn't equal A. You're not you! You're someone else! This sentence is false! Right. The only reason to watch this ep, IMO, is Rock and Andrea in Andrea's outfit. 1. 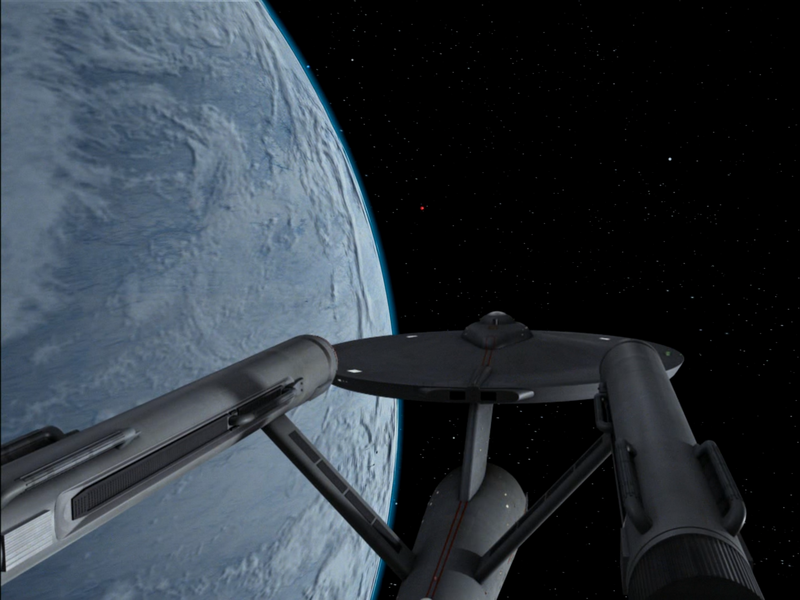 For me, it is the Star Trek equivalent of Conrad's 'Heart of Darkness'. Like Conrad's Novella, the protagonist ( Kirk) goes in search of his hero, only to find he is not what he expects? The plot is subtle, and the diverse dillemma's that provoke alot of thought for me. 2. The acting is superb. I especially love Dr Corby. I wish they had used him as a villain again e.g. Instead of Kahn. 3. That female android ... She is gorgeous. I can watch this again and again. I pick new things up all the time.